News from Silvi Naci (Fine Arts, Graphic Design 2011) about ‘The Joining Project,’ a community building public art project she directs. Join her at the Cyclorama on April 18th to participate in this awesome public art project! With help from the BCA & BAC, we invite you all to a close-knit hangout at the Cyclorama this coming friday before Marathon monday. Hope you can make it out and knit along with us, fill out some wish tags and meet good people. 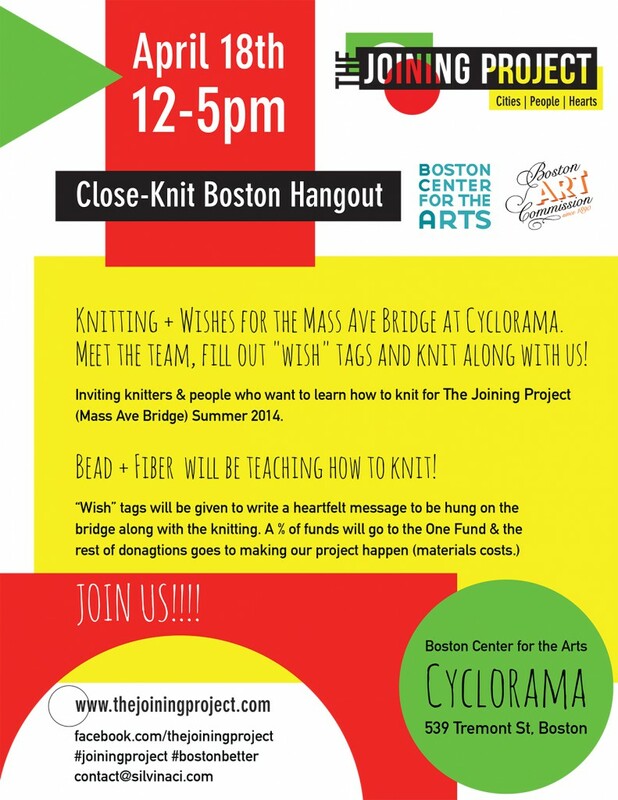 Inviting knitters & people who want to learn how to knit for The Joining Project (Mass Ave Bridge) Summer 2014. Bead + Fiber will be teaching how to knit and you can also follow along. “Wish” tags will be given to write a heartfelt message to be hung on the bridge along with the knitting. A % of funds will go to the One Fund and the rest goes to making our project happen (materials costs). The connection that knitting and crocheting artists make are beyond warmth and comfort, they are personal and joyful. The Joining Project invites you to knit, crochet, and use fabric art to cover Mass Ave Bridge- Boston. Let your message be a happy, uplifting one encouraging a better and happier community in response to Marathon bombing. Previous Previous post: Graphic Design Senior Show Celebration!